Areas of buildings that experience a lot of foot traffic generate high levels of noise, typically. 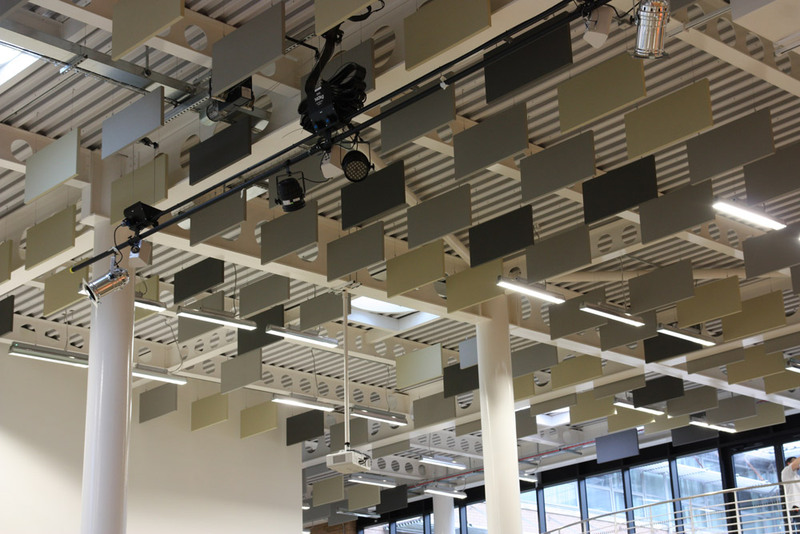 Usually this isn’t a concern, however, when the area has a dual use, such as at The University of Westminster in London, a comfortable noise space becomes important. 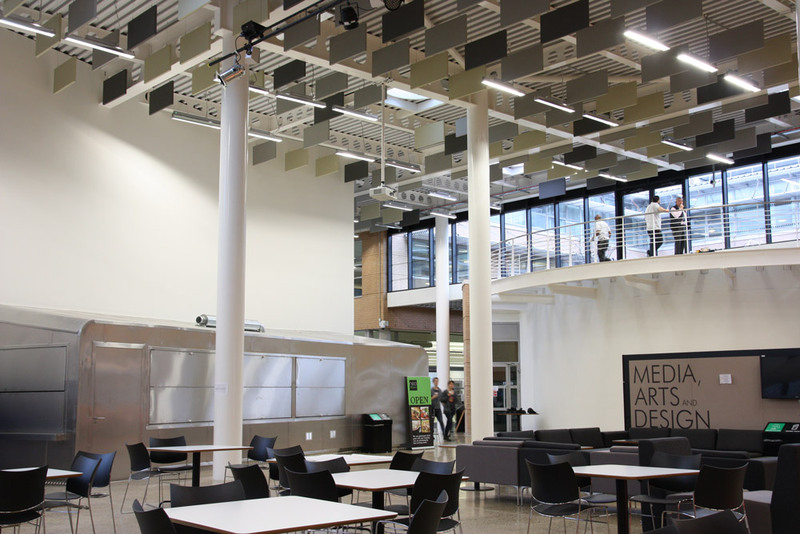 This atrium space at the University is used to welcome visitors, as well as a break-out area. Before treatment, the room was essentially a noise box, with a corrugated metal ceiling propelling noise from human activity around the space, compromising its dual functionality. 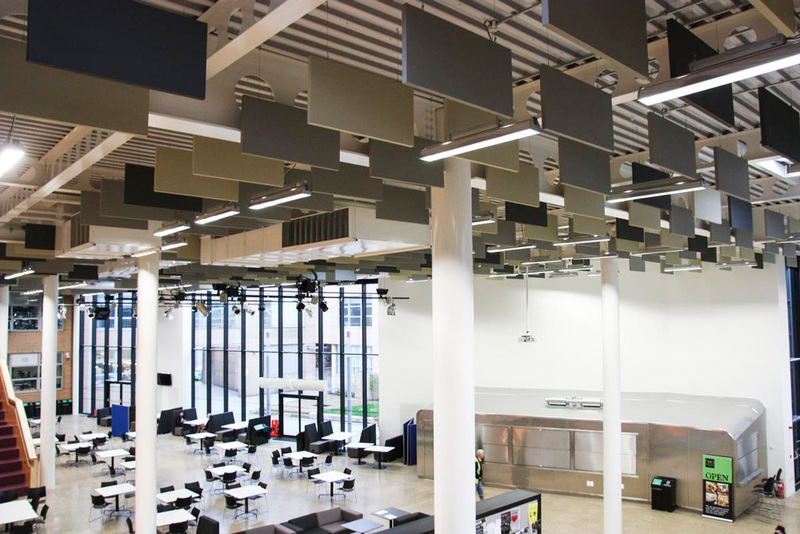 The ceiling in the University atrium was the obvious choice to add sound absorption, being the only flat surface that spread across the length of the space and acting as a highly noise reverberant surface. As a services ceiling, horizontally applying the panels to the ceiling wasn’t possible. Therefore, vertically suspended baffles were used. A series of non-standard colours were used to match the pre-existing colourways of the space. A difficult space to treat, the result was a significant reduction in decibel level and reverberation time in the room, making the area more comfortable and fully functional for a multitude of uses.